Origin: Broadly distributed the extreme desert Southwest south through Mexico all the way south to into Argentina. Landscape Use: Floral accent, background screen, specimen around large patios and ramadas exemplifying regional or Spanish architecture; best used in oasis and transition landscape designs settings. Form & Character: Evergreen to partial evergreen large shrub, upright and open, festive, informal, subtropical to tropical. Growth Habit: Vigorous and upright to 15 to 20 feet but can be easily maintained at 5 to 10 feet. Hardened stems of all Tecoma species are very brittle. 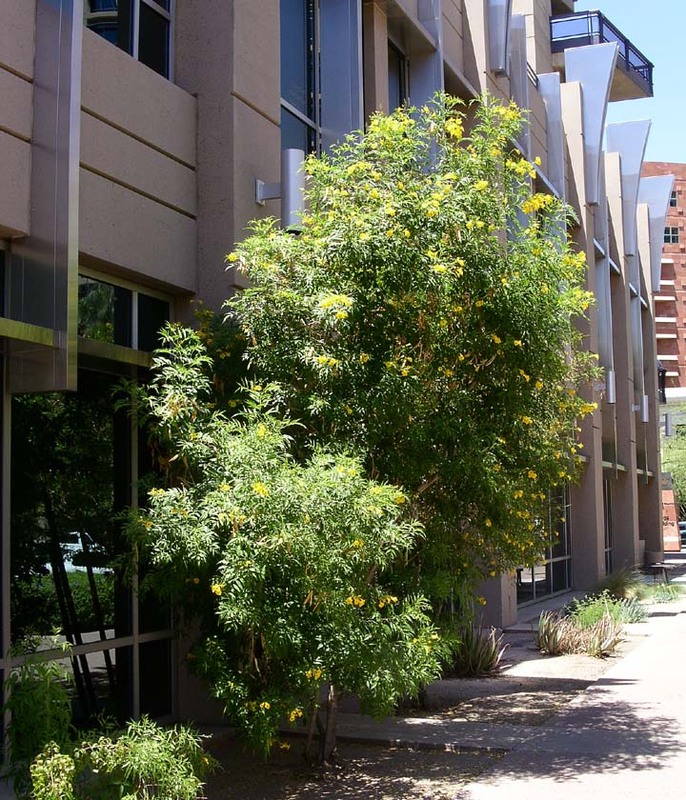 Semi-dwarf cultivars are generally less vigorous and are more serviceable in compact Phoenix landscape spaces as accent shrubs. Foliage/texture: Opposite, pinnately-compound leaves on brownish gray stems, leaflets coarsely serrate, stem lenticels and auxiliary dormant buds are obvious; medium coarse texture. Flowers & fruits: Beautiful yellow to yellow orange red trumpet flowers in terminal clusters; fruits are long, narrow, unattractive brown pods. 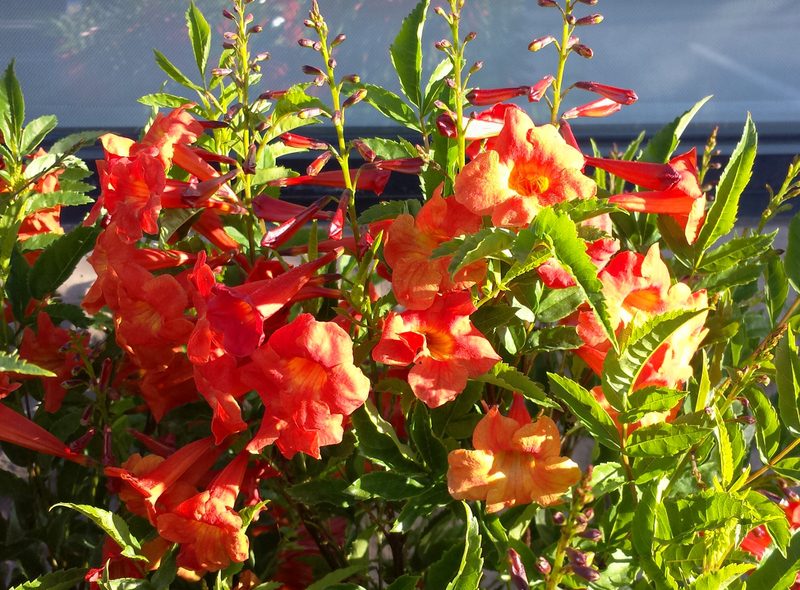 Seasonal color: Yellow to apricot to red colored flowers during all growing season, heaviest in spring and fall. Temperature: Heat loving, but freeze sensitive. In climates colder than Phoenix, yellow bells will freeze to the ground every winter. 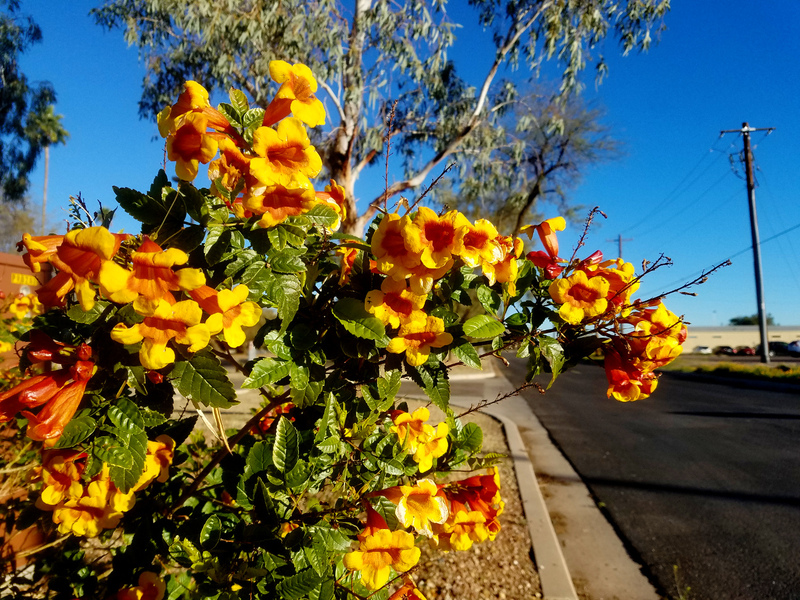 In Phoenix, yellow bells will have freeze damage to leaves and small terminal stems most winters, but recovers very quickly in the spring. Light: Full sun is required, will grows in an loose, open and rangy manner if shaded even lightly. Soil: Yellow bells is tolerant of all Arizona soils except those with the highest degree of alkalinity. 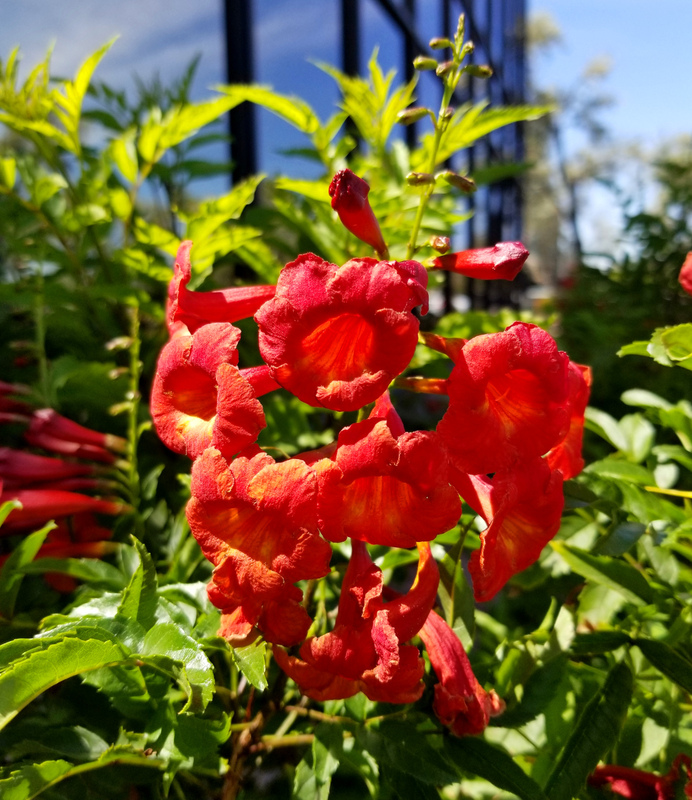 Watering: Yellow bells responds well to regular water and fertilizer applications during summer by producing more vigorous growth and heightened flowering. It will tolerate only moderate amounts of drought. Pruning: Prune yellow bells hard in the winter to control height and stiffen upright character. Disease and pests: In the Phoenix area, Texas and phytophthora root rot fungi occasionally cause sudden plant death, usually only in heavy soils with a former agricultural use history. During late summer of good monsoon years, a leaf skeletonizer catepillar will ravage foliage on upper stems primarily. The damage to foliage is short lived and cosmetic, not lethal. Several chemical control strategies are available including a biological spray Bacillus thurengensis; however, given the growth habit of Tecoma and its rapid recovery after pruning, I recommend that one strongly head back (prune) infested plants and dispose of the damaged material. Additional comments: This is a great, medium to large (depending on cultivar) accent shrub for large spaces. Yellow bells can look 'sparse' during periods of winter cold or high summer heat. T. stans var. 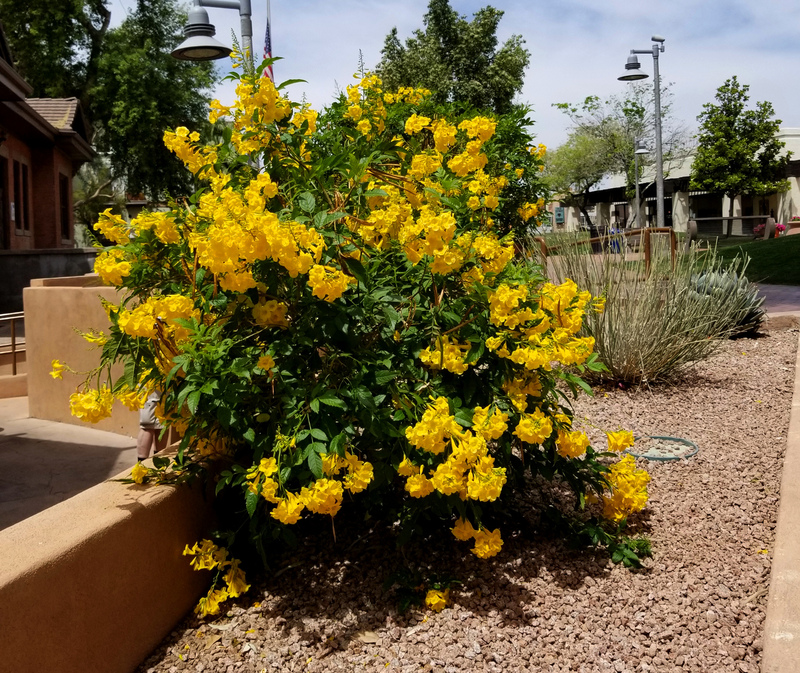 angustata (Arizona yellow bells) is a smaller and more fine textured northern varietal cline from southern Arizona, New Mexico, west Texas and northern Mexicio that is more drought tolerant, but also more susceptible to Texas root rot in most formerly agricultural soils. Other superior cultivars and hybrids of T. stans in the Phoenix area include 'Gold Star' and 'Sundance', both of which are cultivars of smaller size and flower profusely. The cultivar 'Gold Star' was selected by Texas plant breeder Greg Grant from a private garden in San Antonio, Texas. Tecoma x 'Bells of Fire', a compact hybrid with red flowers. Tecoma x 'Crimson Flare', a cool cultivar with deep red flowers. Tecoma x 'Sierra Apricot' PP20246, a unique dwarf hybrid of T. stans and T. alata with abundant apricot-colored flowers that grows to about 3 to 4 feet in height with a slightly greater spread. Tecoma x 'Solar Flare', moderate grower with tangerine orange flowers. Tecoma x 'Sparky', a hybrid with a subtle mixture of yellow and moroon simulating the colors of Arizona State University. 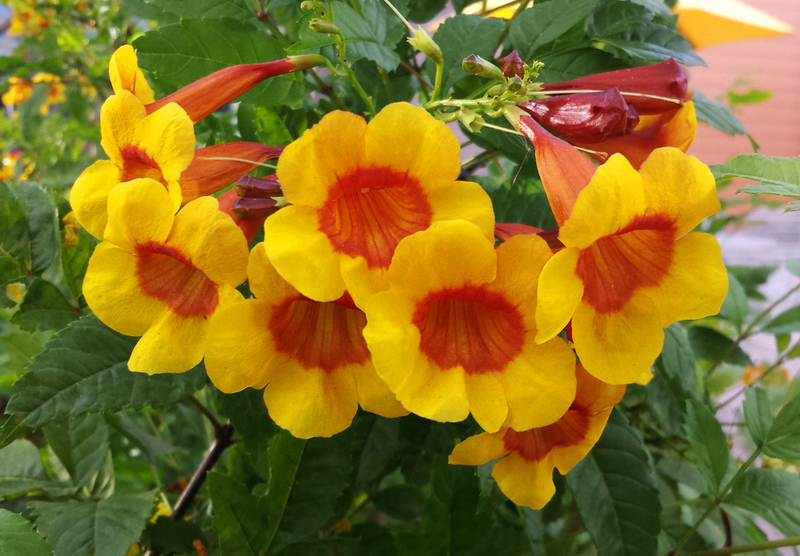 Tecoma x ' Sunrise', free flowering hybrid with copper colored flower buds opening to a two-toned copper and yellow flower. Yellow bells has long been known and used by native Americans of the Southwest and Mexico for bowmaking, bee fodder and medicines. It is considered an invasive plant in south Florida and Hawaii.